I know, I know, I haven’t written in a year. I’m not going to waste a lot of time on throat-clearing but I want to assure you that I’m still here, and I still like you, and as always, I want to help you elevate your cocktail game. I was fishing around for novel flavor combinations that would be timely for the winter season, and I found that green peppercorn jelly is appropriate to mix with beetroot, as is cumin, as is orange oil. I decided to put all four of them together, using beet juice as the bridge between the other ingredients. For the beetroot, I ran several beets through a masticating juicer and then a fine-mesh strainer and then a chemex. Chemex clarification of juices works better with some juices than others. Beet is among the ones that work less well. Although my beet juice did achieve an elegant texture, its color was so dark that there was no noticeable effect of clarification. You could safely skip the chemex step, but you might consider straining through a 100 micron superbag. I tried this drink with both bourbon and rye, and I discovered that the additional sourness that comes from a rye was a better complement to the sweet and earthy notes of the cumin and beet. Use a workhorse rye for this, as anything subtle will tend to be drowned out. For the cumin syrup I toasted about a teaspoon of whole cumin seeds in a pan, then crushed them and simmered them in a 1:1 simple syrup until their flavor was extracted. In the past I used to reach for lemon juice as my cocktail acid of choice, but a man can only drink so many lemon or lime sours before he starts to ask what other acids exist. Most every good cocktail has a source of acidity, except for the family of drinks that takes after the old fashioned. For this drink I used a quarter ounce of 10 year aged balsamic vinegar. It is syrupy and sweet, but it also adds the ascetic tang on the backend that is needed to find balance and challenge. Finally, for the green peppercorn jelly, I crushed ~2 teaspoons of green peppercorns with a mortar and pestle, and simmered them with sugar, agar agar, and filtered water. As soon as the agar dissolved, I poured the mixture through a strainer into a small mold and let it set in the fridge. In 20 minutes I had a firm, pale green jelly. Express Orange Oil over the drink and discard the peel. Serve with Green Peppercorn Agar Agar Jelly. Bring all to a boil and whisk until sugar and agar agar are fully dissolved. Strain into a small mold and chill in the fridge for 20 minutes. This is not one of those viscerally delicious, I-can’t-wait-to-have-another-one type of drinks. I don’t think beet juice is anyone’s favorite, but my hope is that a refined palate can appreciate this as a much more cerebral cocktail experience. First, the imbiber should take a sip of the drink, and observe its sweet, earthy, and spicey notes. The flavors are more or less orthogonal and exist such that each is distinct. Then, they should take a bite of the peppercorn jelly. The subtle piperitious burn lingers on the palette with an unctuous, floral note. Another sip reveals an unexpected synergy between peppercorn, beetroot, and cumin, pulling the brighter elements of the drink’s composition into contrast against the bassy note of the pepper. I apologize (#sorrynotsorry) for the previous two paragraphs but I have been watching a lot of Iron Chef Japan lately. Categories: modern drinks, original creations | Tags: agar agar, balsamic vinegar, beets, bourbon, cocktail, cocktails, cumin, cumin syrup, drinks, green peppercorn, jelly, mixology, molecular mixology, orange, orange oil, orange peel, pepper, rye, spirits, syrup, vinegar, whiskey | Permalink. I made this a few weeks ago, and I just couldn’t let it sit any longer. I think it is one of my best drinks to date. I was influenced by my time in Japan, particularly at the bar of Gen Yamamoto, who I think is one of the most creative and inspiring bartenders in the business. The strength of his drinks is in their subtlety, and in the way that the natural flavors of his ingredients become objects of contemplation. To duplicate this effect, I have been casting fresh fruit juices from my macerating juicer in the role of the base spirit, and using lower volumes of alcohol as accent marks. The juice from soft fruits is often saturated with soft pulp, and as such the yield from an apricot or a kumquat is halfway between a juice and a purée. 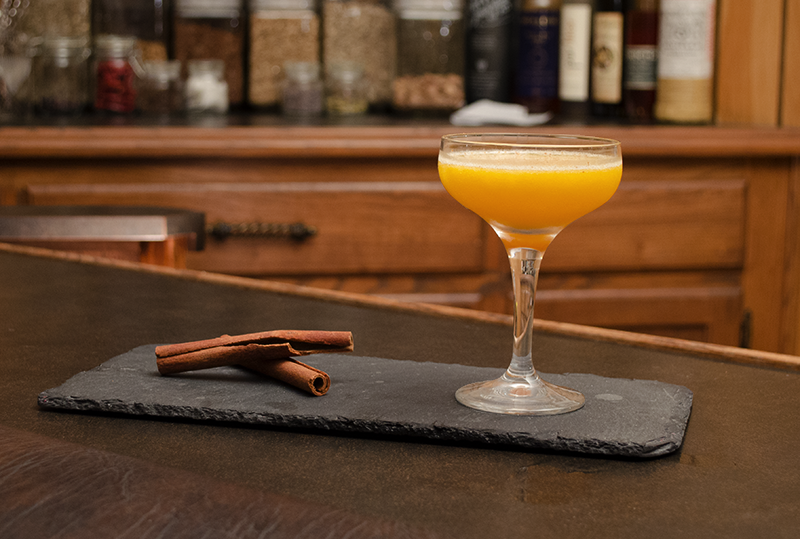 The balance of the viscosity of the juice against that of the spirits provides ample space for a bartender to meditate on texture. 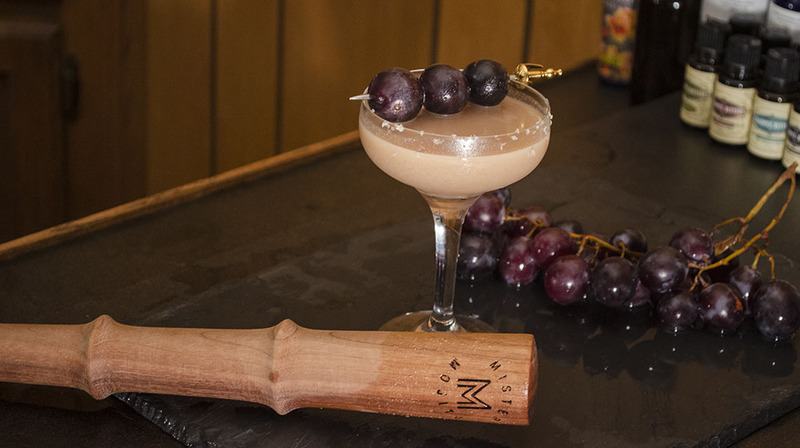 Shake and strain through a fine-mesh strainer into a coupe glass. Agitate the mixture through the strainer with a barspoon if necessary. Grate fresh cinnamon across the top. In the past I was quite offended by vodka, but I have found that it is highly desirable in this style of drink. Soju, Shochu, Sake, and Vodka all have their place when the emphasis is on the delicate and ephemeral. The mere presence of alcohol can make other flavors seem louder and more distinct. Wine, whiskey, coffee — we are accustomed to looking for the entire world of culinary flavors in these things — but perhaps we can perform the same trick with an apricot? My method is to use a minimum of a spirit to achieve its presence in the end product, and then pad the volume of 80 proof liquor in the drink up to a single ounce. In this case, I wanted to combine the vanilla and bourbon with the taste of fresh apricot, but I wanted the bourbon to play the auxiliary role. 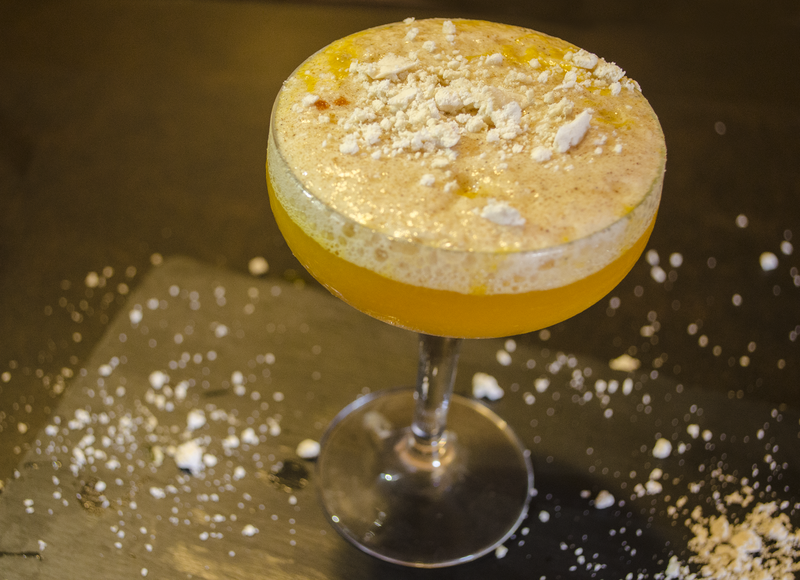 Apricot can be quite acidic when consumed as a juice; it is tangy and floral, and a bit of sweetness from syrup draws out hints of spice; cinnamon in the garnish and vanilla in the bourbon should be like echoes of the notes struck by the fruit. Raw fruits and vegetables can possess a surprisingly complexity all on their own, if one is patient and attentive. Anything as strong as bitters or herbal liqueur would be distracting, like a crashing cymbal in the middle of a cello suite. Finally, an optional half measure of orange juice blends very seamlessly into the apricot, elongating it, and recalls the flavor of a tangerine. Unfortunately, it sacrifices some of the apricot’s sharpness. I suggest trying both variations. 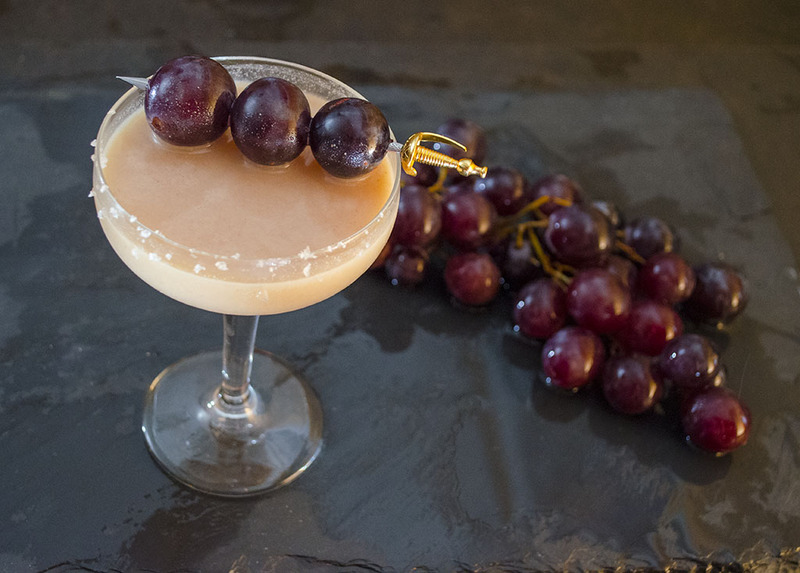 Categories: original creations, spirituality | Tags: alcohol, apricot, bartending, booze, bourbon, cinnamon, cocktail, cocktails, craft bartending, craft cocktails, drinking, drinks, garnish, infusion, liquor, mixed drinks, mixology, orange, shaken, spirits, vanilla, vodka, whiskey | Permalink.